Before starting your search, check out the geographic map below. It will give you an idea of the time required to travel by public transportation between the University and the target zone. 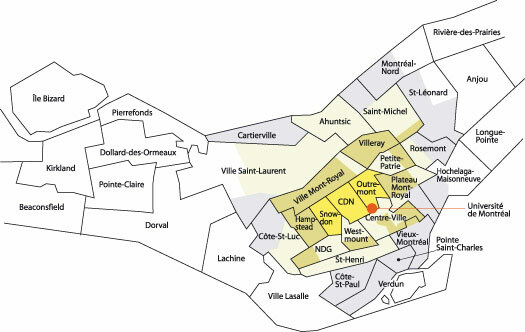 This is a map of the Island of Montreal divided by neighbourhoods. Each colour corresponds to the rough time required to travel by public transportation to the Université de Montréal. The Faculté de médecine vétérinaire is located at 3200, rue Sicotte, Saint-Hyacinthe. Consult the map of Saint-Hyacinthe campus or the city plan of Saint-Hyacinthe.